Is Rising Isolationism in America Dangerous? 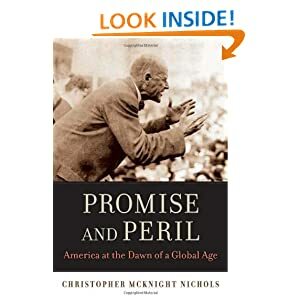 Christopher McKnight Nichols is the Andrew W. Mellon Postdoctoral Fellow in U.S. History at the University of Pennsylvania. He is author of "Promise and Peril: America at the Dawn of a Global Age" (Harvard, 2011), senior editor of the "Oxford Encyclopedia of American Military and Diplomatic History" (Oxford, forthcoming), and co-editor and co-author of "Prophesies of Godlessness: Predictions of America’s Imminent Secularization" (Oxford, 2008). Cross-posted from the blog of the Society for Historians of American Foreign Relations. Wherever the public’s attention roams these days, looming in the background is a renewed danger: Americans, and especially elected officials on the right, are becoming more isolationist. National polls and the statements of GOP presidential candidates reveal a widespread insistence for the U.S. to pull back from its global commitments. Even apparent successes, such as the limited multilateral intervention in Libya, do not restore, much less rebuild, confidence about the positive payoffs from U.S. engagement. What is worse, today’s isolationists are both different from and in some ways more dangerous than those of the so-called “heyday” of isolationist politics, the 1920s and 1930s. In matters of trade and commerce we have never been isolationist and never will be. In matters of finance, unfortunately, we have not been isolationist and never will be. When earthquake and famine, or whatever brings human suffering, visit any part of the human race, we have not been isolationists, and never will be. … [I]n all matters political, in all commitments of any nature or kind, which encroach in the slightest upon the free and unembarrassed action of our people, or which circumscribe their discretion and judgment, we have been free, we have been independent, we have been isolationist. Later, leading up to the 1952 presidential campaign, Democrat Adlai Stevenson famously warned of the “challenge of a new isolationism.” Stevenson found allies among Democrats and Republicans in the wake of WWII to help defeat isolationist calls, such as from Republican senator and GOP presidential candidate Robert Taft, who advocated the doctrine of the “free hand” (a la Borah) and urged the nation to spurn NATO and strictly limit its commitments to Western Europe and the world. Today, America is confronted by a similar challenge. Yet it is failing to take account of the lessons of history or the benefits of an engaged U.S. presence in the world. Moreover, when a bloc of “Kucinich Republicans” emerged in June in the House of Representatives to de-fund U.S. activities in Libya, they went further—pushing hard for trimming or even eliminating many traditional U.S. military, diplomatic, and economic commitments. In addition to opposing “further military” action in Libya, Republican Speaker John Boehner argued that the U.S. can and should strategically withhold funding from the United Nations and the International Monetary Fund. Representative Ron Paul, for his part, has rejected the label “isolationist” (thrust upon him and many of his retrenchment-oriented colleagues by Senator John McCain among others), which he rightly notes is inflammatory and lacks clarity. (See Michael Hunt’s trenchant analysis of the term and its frequent misuse.) Paul differentiates himself from fellow conservatives by blending arguments for large-scale global disengagement with assertions for sweeping budget cuts. Calling himself a non-interventionist, he stresses that the nation is “going broke” and sounds more than a bit like Borah as he pushes for cutting practically all foreign aid as well as U.S. bases and embassies abroad. Such a policy, Paul says, is “what the Founders advised … [w]e were never given the authority to be the policemen of the world.” Paul’s libertarian individualist ethic also would not do much even to help in cases of famine and relief. Many Tea Party Republicans comparably now aim for pulling troops back from virtually every deployment abroad and for drastic reductions in defense and foreign spending. Some of this is merely political posturing. But consider the latest poll data by the Pew Research Center revealing that, by most measures, roughly half of all Americans are weary of extensive worldwide military, diplomatic, and aid commitments. They yearn for the nation to “mind its own business internationally” and “reduce military commitments overseas” to help decrease the deficit. So we can’t help being struck by the continuing salience of a heavily circumscribed vision of the U.S. role in the world. Call it what you will: isolationist, non-interventionist, or perhaps some narrowed, crass form of realism. Wherever one lies on the political spectrum vis-à-vis U.S. worldwide commitments, there can be no doubt of the power that the word “isolationism” and the appeal of many concomitant ideas still possesses in our national dialogue. In short, the recent depictions of a rising “neo-isolationism,” particularly in the Republican Party and across the electorate, seem accurate and more than merely ephemeral politics. Given that more than three-fourths of Americans approve President Obama’s decision to pull troops out of Iraq and 70 percent reject U.S. efforts at democracy promotion abroad, particularly in terms of military action to overturn the rule of dictators, it is clear that Bush-era hubristic unilateral interventionism is profoundly unpopular. During the upcoming GOP debates, particularly Saturday’s on national security and foreign policy in South Carolina, and in the not-too-distant primary and then presidential election cycle, whenever questions of international affairs arise, will we see more shrill rhetoric about retrenchment? Moving forward in the next round of debates, I suggest and hope that the various candidates and parties will address specifics about at least the following two thematic sets of questions. First, national security in a period of recession. At the intersection of proposed efforts to reduce the national debt and enhance national security lies proposed cuts to diplomatic, aid, and defense spending. How can or should these perhaps competing imperatives be balanced? Second, the international affairs norm of the so-called “responsibility to protect.” Should the U.S. continue to observe and act on that premise, as in Libya? If so, what could and should the U.S. be doing in terms of, for example, the humanitarian tragedy unfolding in the famine across east Africa and regarding the continued slaughter of civilians in Syria? A related potentially perilous aspect of recent manifestations of isolationist sentiment are the persistent calls by Republicans (and occasionally a few Democrats) for slashing funding for the State Department and diplomacy and engaging in fewer commitments—not just in warzones but also in relief operations around the world. Led by Republican Representatives Jim Jordan and Scott Garrett, more than 160 Republican members of the House have pledged to steer just such a course. They seek to defund the U.S. Agency for International Development (USAID), the U.S. Trade Development Agency, and other international commitments—the spending for all of which represents less than 2 percent of the federal budget. In response Secretary of State Hillary Clinton decried the proposed cuts as “devastating” to national security, humanitarianism, and “our leadership around the world.” She remarked that, at a unique moment of “democratic awakening in places that have never dreamed of democracy,” crushing the flexibility of the State Department with its aid budget would eliminate soft power in those promising long-range efforts around the globe that America must sustain. In some respects, today’s calls are more irresponsible than those of the past. First, they conflate the nation’s necessarily urgent tasks for imposing fiscal reform and generating economic growth at home with an updated and constricted form of realist “America first” policy abroad. Unlike in the 1920s and 1930s, when non-interventionist foreign policy principles were primary, today the appealing claim is that fiscal responsibility is central—and the advocates offer a deceptively simple injunction: disengage and cut, cut, cut. Yet turning inward—and away from providing the relatively inexpensive foreign aid and diplomacy that can make a difference globally and being active in international economic policy—is highly unlikely to help fix our fiscal woes. Further, being uninvolved abroad inevitably will mean the nation becomes less of a player at a moment when U.S. goals—and, yes, U.S. global interests—demand resourceful, informed, nimble leadership. Second, an interesting point of comparison lies with questions of consistency. In my own work I have been surprised to find that figures like Borah, Nye, Hiram Johnson, Arthur Vandenberg, and other so-called “isolationists” of the 1930s were not in fact as narrowly “isolationist” as we tend to remember. They were often lambasted, as Borah was, for changing opinions and taking an ad hoc approach to foreign policy. In contrast, many of those currently pushing for the U.S. to disengage from world affairs are often radical in their aims for a one-size-fits-all diplomatic doctrine; unlike Depression-era isolationists, contemporary advocates also place far too much focus on an unswerving regime of domestic economic austerity measures as a route to both national and world “progress” (rarely well defined). Third, contemporary isolationist visions appear to be more obtuse than their historical predecessors because of today’s increasingly globalized context. During the 1920s and 1930s, America’s rising global roles were expressed largely in terms of internal drivers, particularly from commerce and finance. The modern systems of international organization and trade were in their infancy. Therefore it seemed to many Americans, leaders and citizens from across the political spectrum alike, that the nation—unaccustomed to playing a dominant diplomatic and military role in the world system—could afford to be relatively isolationist. Taking a non-interventionist, neutralist diplomatic course while pursuing increased trade abroad, aptly termed by George Herring as “involvement without commitment,” in hindsight seems deeply mistaken. Contemporary calls for retrenchment appear to have similar perils. They also are less honest, because they do not tend to acknowledge the myriad ways in which American commercial and banking interests act as de facto conduits of American foreign policy, an issue that was absolutely vital to the arguments of interwar isolationists on both the Left and the Right. In the wake of having been embroiled in Iraq and Afghanistan for almost a decade Americans today seem as cautious about the becoming entangled in costly wars and constraining power politics as citizens were leading up to WWII. Recall that polls as late as November 1941 indicated that most Americans did not support a declaration of war against Germany, Japan, or Italy. In that period, we must remember, the U.S. role as a hegemonic stabilizer of markets and nations was not well established; figures like Borah fought to keep the nation as un-entangled in commercial and financial exchanges as possible with the goal of preventing being drawn into a conflict not otherwise vital to the nation. Yet, though this course was hotly debated, the U.S. nevertheless participated in a surprising array of international economic conferences, arms limitations treaties, foreign aid, and commercial and cultural exchanges, all during a period too often mythologized for U.S. disengagement and isolation. Now the issues and the choices—and the consequences of the choices made—are different, and perhaps even more complicated than in the 1930s. Today with China and India growing precipitously in terms of economic power and diplomatic muscle, with the proliferation of nuclear capabilities in the Middle East and beyond, with continued threats posed by international terrorism, with scores of concerns related to health and energy across the global social commons, and with the American domestic economy and job growth stagnant—and the nation thus weakened, generating a cohesive and engaged U.S. role in the world is at least as enormous a challenge, or more so, than in the 1930s. The historical comparisons, while strained, bring into focus illuminating parallels. Isolationist efforts to keep America out of conflicts and prolonged diplomatic engagements did not and could not suffice in the past. They are unlikely to achieve desired results in today’s far more globally interdependent world. Pulling back from expensive and alienating military engagements seems wise; but ruling them out entirely is just as naïve as blindly blundering into the use of force abroad. From the rising importance of exports in the recovery of the American economy, to the expected gains in offering assistance to burgeoning democracies in the Middle East, there is no choice but to engage globally. Renewed isolationism would undercut America’s clear and present aspirations in international organization and trade, in aid and relief, in science and technology (where cooperation is as essential as competition is stringent), and in a multitude of other activities. Foreign assistance, executed well, wins friends and fulfills American values. So, too, does the U.S. need to weigh in on such global issues as environmental protection and human rights. Burdens can be shared. But they must neither be ignored nor shirked.